“By faith Abraham, when he was called to go out into a place which he should after receive for an inheritance, obeyed; and he went out, not knowing whither he went” (Heb 11:8). By faith Abel WENT DOWN to the grave as a martyr. 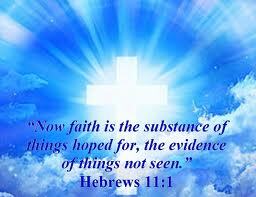 By faith Enoch WENT UP to heaven without seeing death. By faith Noah WENT INTO the ark. But by faith Abraham WENT OUT not knowing whither he went. “By faith … obeyed.” Faith is a great incentive to obedience. Disobedience is a clear sign of doubt and unbelief. Please note, it is very hard to obey, particularly in old age, when one’s ideas and thoughts are fixed based on past experiences. Abraham was the first missionary to go out with the gospel and die in the country to which God sent him – unlike many modern missionaries who go to their native country to retire and die. “By faith Abraham… was called to go out.” Though he didn’t know where he was going he knew with Whom he was going. By faith Abraham was separated from his country, people, home etc. for the sake of the truth. We too need a separation for the sake of the truth. People who are called to be the children of God sometimes mix up with the world, and are conformed to the world – all because they do not have a true faith.